Dave at Camp on Wheels first recruited me to create a logo for the mobile summer camp about five years ago. 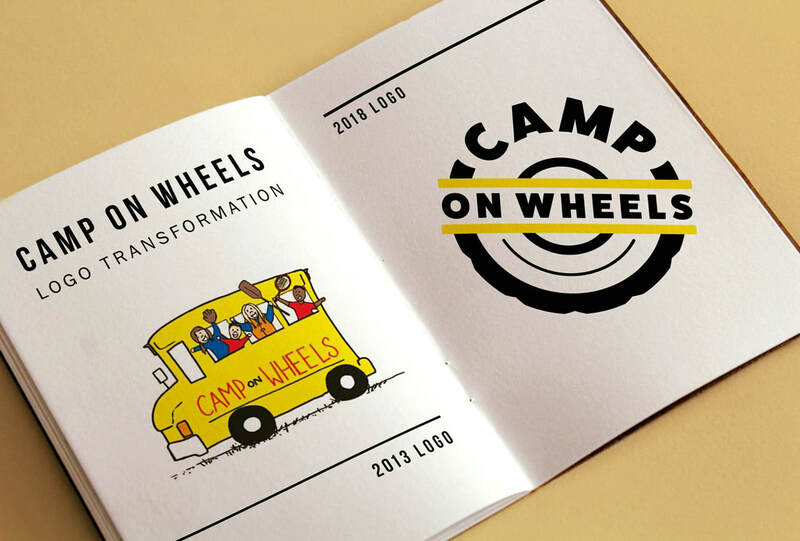 Since then both his business and my skills as a designer have grown greatly so we worked together again this year to create a new visual identity for Camp on Wheels. This new logo is both playful and professional, much like the business itself. From the beginning of this project, Meg at Concord Computer Services wanted a clean logo that directly appealed to her audience. Combining a simple symbol of the tech world, the WiFi symbol, with a crisp, open typeface to form this compact logo, the Concord Computer Services brand speaks to both the small business looking for support and the everyday user looking for approachable expertise. As a health and wellness coach, Cindy works with her clients to find what works best for their specific body and lifestyle. In developing her logo for True to You, LLC, I focused on visually representing the support and collaboration she had with her clients. The two butterflies in this logo can also be seen together as one, while the symbolism of the butterfly wings alludes to the freedom of knowing and acting true to yourself. Because her work focuses on what we ultimately feed our bodies and where we choose to draw our energy from, I also chose to incorporate a simple, yellow arc representing the sun. To kick off her business Sandi, of Movement & Wellbeing 101, needed a professional logo to communicate her unique approach to helping people meet their health goals. She believes maintaining overall wellbeing is dependent on not only developing a challenging and consistent work-out routine, but also taking the time to adopt healthy eating habits. In focusing on an icon, I created two equal parts, reminiscent of the yin-yang symbol, that work together to create the overall shape of an apple, a traditional symbol for health.